UEFA’s Centre of Refereeing Excellence has staged its inaugural course for young women referees, with crucial guidance given to the officials at this important stage of their careers. The care given by UEFA to nurturing European match officials has been successfully extended to include up-and-coming women referees, who are now a new component within the UEFA Centre of Refereeing Excellence (CORE) programme which gives crucial guidance to officials at a key early stage of their career. 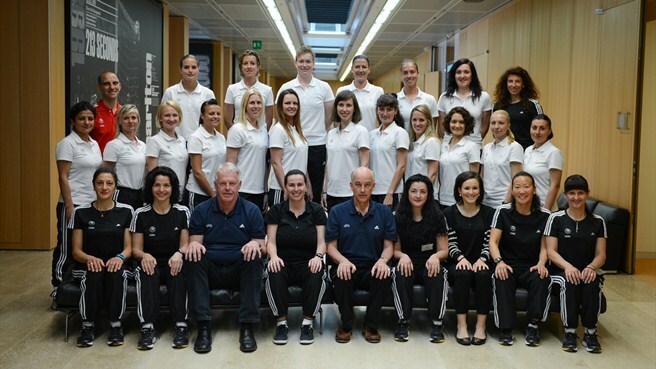 Eighteen young referees and assistants from 18 UEFA member associations came to Nyon for the inaugural CORE Women’s Development course. They trained and learned, with expert coaching and refereeing assistance designed to help them move forward in their careers, and were also given the opportunity to take charge of matches in Switzerland, Belgium and the Netherlands during their stay. UEFA is integrating female referees into the CORE programme at a time when women’s football is enjoying a meteoric rise in popularity. This month, Chelsea FC’s Stamford Bridge home stages the UEFA Women’s Champions League final, and UEFA Women’s EURO 2013 follows in Sweden in July. While top-level European women referees – who have now joined their male counterparts at UEFA’s courses – are getting ready for work on a major stage, the younger generation is gaining experience thanks to CORE, which seeks to raise refereeing standards within Europe’s member associations, with a keen eye on tomorrow. “We’ve had a very successful first CORE Women’s Development course,” said David Elleray, a former international referee from England and CORE senior course leader. “The referees have done well. They’ve found it demanding and challenging both physically and intellectually. There has been a lot of practical work, and [while here] they have taken charge of matches in Switzerland, Belgium and the Netherlands. “The referees are younger ones who are showing potential for the future, and others who have received good observer reports, and who we would like to see operating more intensely,” added Elleray. Elleray and fellow UEFA Referees Committee member Bo Karlsson were in excellent women’s refereeing company at the course, as they were joined by the Czech Republic’s Dagmar Damková – herself a Referees Committee member and a former international referee who handled the 2011 UEFA Women’s Champions League final – and Sweden’s Jenny Palmqvist, referee at last year’s decider. Both were on hand to provide advice and help the young arbiters hoping to emulate them one day.